Soaring through the clouds in 1925, passengers on an Imperial Airways flight traveling over Germany were treated to a brand new novelty—one of the first in-flight movies. Even more astounding? The film had live orchestral accompaniment. But not in the way you’re probably thinking. No, Imperial didn’t cram the Berlin Philharmonic into stowage, with cellos and cymbals in tow, so that they could awkwardly play along to a movie. This delightfully bizarre experiment in airplane entertainment was achieved with the help of a relatively new technology called radio. The sweeping sounds of a live orchestra were broadcast from the ground to accompany the 1925 silent film The Lost World, a wildly successful adaptation of Sir Arthur Conan Doyle’s dinosaur-filled novel of the same name. 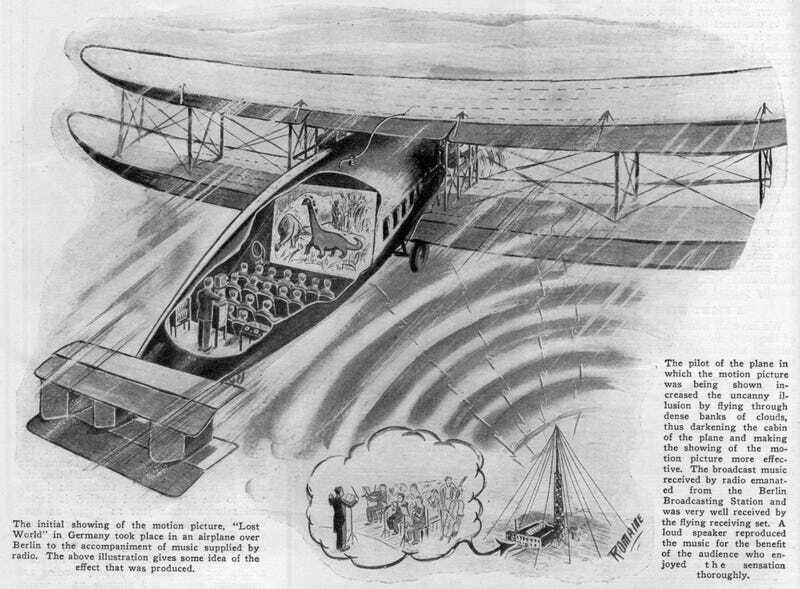 The experiment was illustrated in the July 1926 issue of Science and Invention magazine, with a diagram explaining how the landmark A/V feat was achieved. The Berlin Broadcasting Station arranged the orchestra and broadcast the signal, which was received in air by a radio set on the plane. The music played through a single loudspeaker on-board, though we can guess based on the tech of the time that it was incredibly hard to hear over the sound of the aircraft. The magazine also describes how the pilot flew through dense clouds in order to darken the cabin, a necessary step for seeing the movie projection properly since they were flying during the day. Here in the early 21st century we often think of silent movies as just that—silent. In reality, everything from grand movie palaces to humble showhouses in the 1920s were crackling with noise. There was virtually always music, sometimes in the form of a single pianist, other times with enormous live orchestras. And there were countless experiments with sound effects machines and even live actors reading lines, doing their best to sync their words with the actors being projected on screen. It’s worth noting that these European flights in the mid-1920s weren’t technically the first flights to show an in-flight movie. As a publicity stunt back in 1921, Aeromarine Airways circled Navy Pier in Chicago, showing a copy of the promotional travel film Howdy Chicago. As John Norman White notes in his 1994 paper [pdf] on the history of in-flight entertainment, the Chicago stunt was a silent experience. Aside from the deafening sounds of the prop plane, we can assume. A screen was hung in the fore cabin, an electric light socket supplied power, and a DeVry suitcase projector was secured to a table in the aisle. As sightseeing passengers flew above Chicago, the city’s highlights appeared on the movie screen. There were no concerns related to sound … “talkies” were years in the future. Why would you want to watch a movie about Chicago when you’re soaring over that very city during a time when powered flight wasn’t even two decades old? That’s a perfectly reasonable question, the answer to which has sadly been lost to history. But since Imperial Airways’ specialty was long-haul flights from Europe to places like South Africa, India and Hong Kong, an hour-long movie was probably a welcome distraction in 1925—novelty or not. And the orchestral accompaniment was surly preferable to whatever smalltalk your seatmate would otherwise have tried make.